Our Gray family tradition says that my Great-great-great grandfather James Gray sailed from Northern Ireland in 1790 with the Rev. Abraham Boyd. We have little information on James except that he may have been only 10 years old then, if he was 70 and the James Gray in the 1850 US Census for Allegheny County. Recently we posted an article outlining several other possibilities as to the origins of our Pioneer: James Gray. We believe that he married Mary Patterson in 1805, and was probably also born in the 1780s. Along with my Great-great grandfather William Sylvester, they may have had a son named Dan, who is said to have worked in the lumber business. 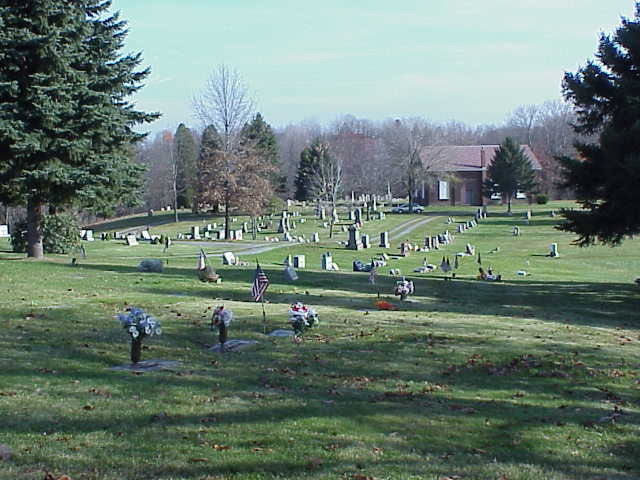 Not James’, nor Mary’s, nor Dan’s tombstones have been found with the rest of the Grays in the family church plot in West Deer Township, Allegheny County, PA, and they were apparently not official members of the adjacent Bull Creek Presbyterian Church, according to session minutes. [We haven’t yet checked land transfers under their names to see if they preceded son William, my, on the Gray family homestead just up the road, about whom more definite information exists.] We’ll learn in a minute that William’s wife Elizabeth Leslie was probably a member of the Bull Creek congregation, according to church records, and we know for certain that they are both buried along with many of their in-laws and related families in the church cemetery: Leslie, Norris, Brown, etc. 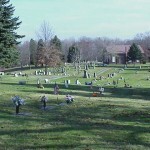 [See the cemetery records and tombstone inscriptions]. This article will explore life on the Pennsylvania frontier in the late 18th and early 19th centuries. We don’t know much about (3X)Great-grandparents James and Mary, but thanks to Bull Creek’s present pastor, the Rev. Dr. James Legge, and several church historians, we are able to give you a glimpse of pioneer life among these Scottish settlers, and in particular Bull Creek’s first pastor, Rev. Abraham Boyd. Their lives are a part of an ongoing project of recording church history, which most recently was described in a bicentennial anniversary book. The Rev. Abraham Boyd was born about 1770 in Scotland. He sailed to America in 1790. The Bull Creek Cemetery has at least a dozen Boyds interred, but one inscription shows a Captain John Boyd (1737-1817) as an American Revolutionary War veteran. He was the paymaster for the 8th Regiment, Continental Line. Was he Abraham’s father, and was his rank of Captain pertaining to his military service or sailing experience? He had obviously been in America long before Abraham. 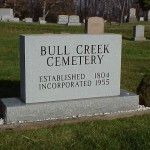 John’s wife may have been Mary (1750-1825), who is also buried at Bull Creek. 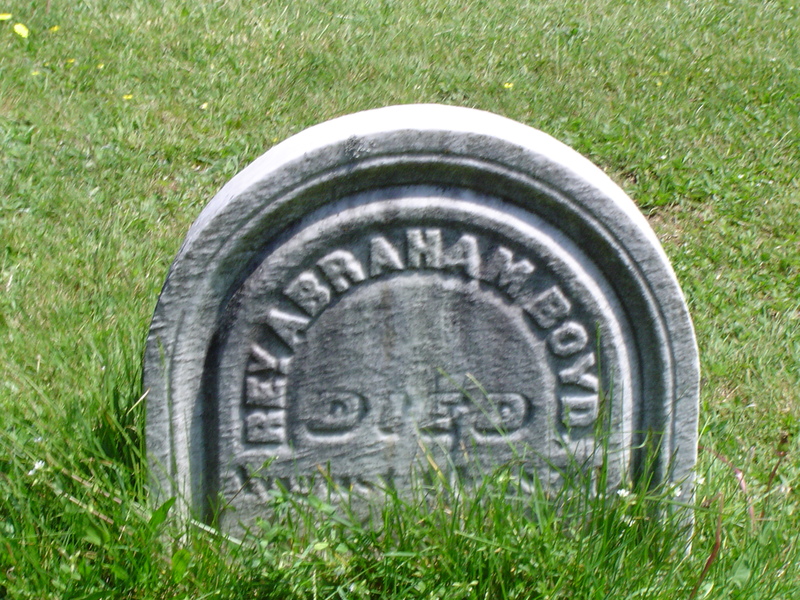 Abraham’s wife was Agnes (d.1861), according to one tombstone, but church records list a Mary E. Boyd who died and was buried there in 1854, perhaps a second wife. 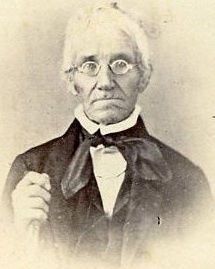 Abraham was the first and longest serving pastor of the Bull Creek church. According to A Guidebook to Historic Western Pennsylvania, the first worship held by local Presbyterians was conducted outdoors in 1796 (46), after which they began to hold meetings in each others’ cabins, with itinerant preachers. Dr. Legg says that one settler in the area, named Cartwright, had recently been killed by Indians, but the growing band of fearless and staunchly independent pioneers decided they needed a church in which to meet on a regular basis. So, they purchased the land, where the church and cemetery are still located, from an Ezekiel Day. One of the eleven charter members of the church was Sarah Day, perhaps his wife. By 1802, the first structure, made of logs, was completed and the group sought a permanent minister. They called Abraham Boyd, a well-liked young man of 32 years of age. The Erie Presbytery ordained him, which is interesting because this area was originally part of the Redstone Presbytery but is now part of the Pittsburgh Presbytery. [See “Faith of Our Fathers: Part II”]. He served Bull Creek church until 1833. That date is significant for another reason as well; the church decided to construct a smaller, brick sanctuary, because the old wooden one was supposedly too large and inefficient to heat. 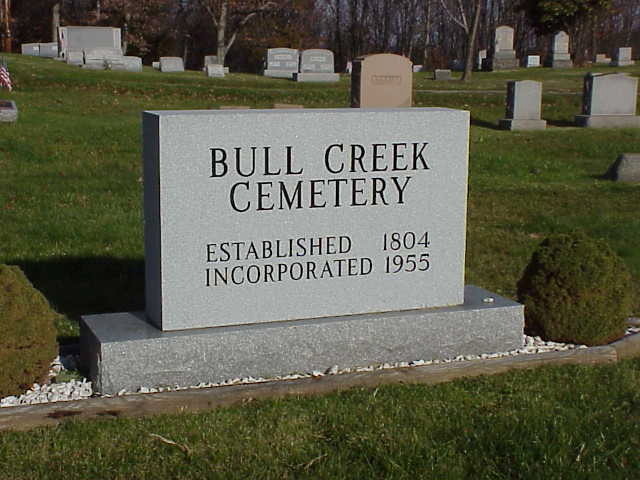 That proud brick structure still stands today, surrounded by the Bull creek Cemetery on three sides. We wonder whether there was some controversy over the matter of constructing a new building when the old one was still serviceable, thus causing Rev. Boyd to consider retiring, Or, perhaps he had led them in the project in the first place. We do know that his eleven charter members had grown to 176 in his 31 years of ministry. Twenty years later, however, the ever-growing congregation had to built yet another sanctuary across the road, which is still used as a recreation hall. Boyd loved riding horseback, not that he had much choice in getting from place to place in those days. He once rode 300 miles to Philadelphia to attend a Synod meeting on the back of one of his horses named “Stumpy.” His other horse was named “Barney,” by the way. In Philadelphia he met a man who later needed some church research done, and when Abraham did it, he was paid $25, probably more than he had ever seen at one time. The story goes that he consulted with his youngest son before deciding to buy a new suit. The irony of the situation was that Rev. Boyd died several months later and was buried in it. The Rev. 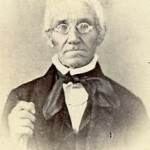 Abraham Boyd died on his Tarentum farm on August 14, 1854, in his 84th year, 11 years after concluding his formal ministry to the Bull Creek congregation and only a year after they had built their fourth place of worship. The Leslie and Norris families’ church records provide a rich source for research, though some ideas will surely be pure speculation and conjecture. Some of the Norrises belonged to the Deer Creek Church. The comparison of membership names and dates to cemetery inscriptions should, however, eventually provide confirmation who our ancestors were and when they lived. While it is difficult to learn and more about their lives, we can read about their contemporaries, such as The Rev. Abraham Boyd, and gain a great deal of insight into what life was like for these Western Pennsylvania pioneers. The Bull Creek Presbyterian Church History. Bicentennial ed. Tarentum, PA: Church Press, 2002. “Cemetery Inscriptions from Bull Creek Presbyterian Cemetery, West Deer Township, Allegheny County, Pennsylvania.” 6/30/02 <HTTP://FREEPAGES.GENEALOGY.ROOTSWEB.COM/~NJM1/BULL.HTM>. Smith, Helene, and George Swetnam. A Guidebook to Historic Western Pennsylvania. Pittsburgh: U. of Pittsburgh Press, 1991. My gr. grandfather, George Sweeney/Sweeny was from the West Deer Twp. in Allegheny Co., PA. In the ‘Merri Old Middlesex’ listed some of the marriages by Rev. Abram Boyd, but no mention of my George Sweeney being a member of the Bull Creek Church. The Norris and Leslie families are family to me through my research of the area. Can you enlighten me re: any info you might have on the Sweeney’s of the area? I am pretty certain they were of the Presbyterian faith. I am fairly sure that my Geo Sweeney came from the Daniel Sweeny family of of Indiana Twp., Allegheny Co. Dan Sweeney died in 1803, but was supposed to have come from Northern Ireland, and maybe related to a Barney Sweeney of Letterkinney, Co. Donegal. I would appreciate any info you may have on this family. My email address is: jerry.sweeney@gmail.com. The 1895 History Butler Co, PA has a biographical profile of a Charles N. Boyd, which provides some biographical info about his paternal grandfather, Rev. Abraham Boyd. It gives Abraham’s father as John. I am seeking to know if Abraham had, in addition to son W.S., a daughter named Isabella. Thanks for asking, Kevin. As you know my James Gray was supposed to have sailed with the Boyds, so I too am interested in anything we can find. Thanks for the Boyd biography. John Boyd and Mary Fulton Boyd were married in Ireland 1766. Their first son John was born 1768 in Ireland. 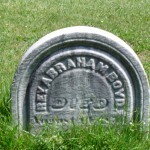 The second son Abraham was born in 1770 in Ireland. They were supposed to sail on the General Wolf in June of 1772 but could not because the two little boys had smallpox. They left on the next ship in 1772. I am a direct descendant of the Rev. Abraham Boyd. Hello! I’m a direct descendant too. And have been researching the Boyd Tree. I came across a beautiful Family Chart last month at the Western Reserve Historical Society in Cleveland, Ohio. It lists John Boyd and his wife Mary Polly Fulton and all their descendants over the next 100 years! It was created by their great grandchildren in 1882. I’m told a copy is also located at the Library of Congress. I am interested in learning who put the gravestone at Bull Creek Cemetery for Capt John & Mary Fulton Boyd. And when was it placed there. And are they buried there, or was it just put there in their honor? Who should I contact to learn more? I am applying for membership in DAR base, he being the son of a patriot. I have read the 1000 Year of Boyd History book. Thank you. Hi Katherine. There’s surely lots on the Boyd and Fulton families, online and in hard copy. Glad their descendants have taken such an interest in preserving their legacy. A call or e-mail to Bull Creek will reveal who planted Rev. Abraham’s memorial. Please stay in touch as I hope to revise my tribute to him soon. Thanks for writing. Thank you Larry. I contacted the church and they say they have a portrait of Rev. Boyd still in the church! Unfortunately, they say all records for the old part of the cemetery are lost, so they couldn’t give me any information about who put the stone there for John & Mary Boyd, or confirmation that they’re actually buried there. But they were very kind. I hope to visit soon and see the portrait.